Way back in 2011 when I was just getting introduced to bourbons after launching the blog with the intention of only covering scotch, I had a relative stinker of a 50ml sample bottle of Woodford Reserve Bourbon, and was called out in the comments by Woodford adherents that I was doing the whiskey a disservice by reviewing it based on the sample bottle. Normally, my opinion is that since many people use 50ml sample bottles to try out new spirits before committing to a full bottle, it’s on the head of the manufacturer if those samples don’t represent the real product. Still, I had an opportunity to revisit Woodford Reserve recently – this time from a full 750ml bottle – and thought it would be appropriate to review it again for National Bourbon Heritage Month. Does my review from 4 years ago hold up? 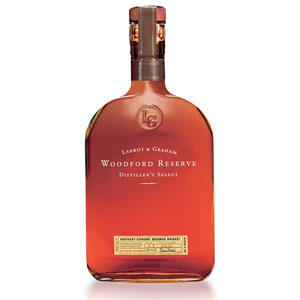 Woodford Reserve, made by Brown-Forman in Kentucky, is Kentucky Straight Bourbon. It’s somewhat unlike other bourbons, in that it contains some percentage of whiskey made in copper pot stills and triple-distilled – in the Irish style of whiskeys such as Redbreast. Unlike Redbreast, Woodford Reserve uses a mash of corn, rye, and malted barley, and also re-uses some of each run’s fermented mash in the next batch – a tradition called “sour mashing”. This pot-still whiskey is combined with column-still whiskey and aged in new toasted oak barrels for between four and six years. 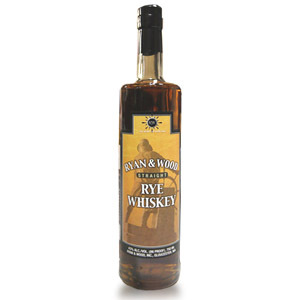 It is bottled at 90.4 proof (45.2% ABV). My bottle is from Batch #941, Bottle #6643. Nose: Toasted marshmallow. Marzipan, cherry pits. Candied apple (the red kind). Over all of that is a blanket of paint thinner or fresh plastic. Palate: Sweet, medium bodied. Almost syrupy. Oak and cashew butter up front, then dried apple, and barrel char. Finish: Medium-long. Continuing flavors from the palate – dried apple, nuts, oak and barrel char. Fades with slight bitterness, some more plastic-like flavors, and a little tobacco. With Water: A splash of water really wakes up the cherry notes. Fresh, tart cherries as well as dried ones. However, it adds some extra paint thinner / varnish on the palate and a slight rotten fruit note that fades quickly. Ups the bitterness of the charcoal notes. Try this one both with and without water to see how it works for you. Overall: First, I should note that my original review was done from a 50ml sample “airline” bottle. This time, from a full 750ml glass bottle, I thought the aromas and flavor were a little more in line with what I expect from a bourbon. There is a nice balance of acidity from the fruit notes (mostly cherry and apple) and the intense nuttiness on the front of the palate. Unfortunately, this is waylaid by what I call “paint thinner”, which is really a slightly bitter, slightly chemical aroma and flavor that I get when tasting especially cheap (although this is not cheap) spirits. This does make an excellent cocktail, where the sweetness, fruit, and nuttiness comes through, although for the price you’re probably better off with a bottle of Eagle Rare (or a Costco 1.5L of Buffalo Trace!). I know there are a lot of Woodford Reserve fans out there, so I’ll qualify my conclusion by saying that this bourbon simply isn’t to MY tastes, although if you don’t detect the plastic/chemical notes that I get, you’d probably find this to be a quite tasty bourbon and worth your money. I’d be the first to admit that my 2011 review was flawed but after tasting from a full bottle, I’ll have to stick to my conclusions. Update: Check out my review of Woodford Reserve ‘Double Oaked’ here. I’m not a big fan of Woodford Reserve, and it’s because there’s too much Woodford Reserve in it. The spirit that comes off these stills needs longer to knock off the peculiarities, time which it doesn’t have because Bourbon would generally be getting over oaked by that time. One man’s opinion. Old Forester Signature, which shares most of its DNA with Woodford, is an inexpensive favorite of mine. I think you reviewed it and found it okay, but you and I really don’t have similar preferences in Bourbon so no surprise there–two of your favorites, BT and Eagle Rare, are two of my least favorites (I’m a huge Four Roses guy), and wheaters don’t really interest me outside of Heaven Hill’s inexpensive offerings. Actually it speaks to the fact that two people with different tastes in Bourbon both think Woodford Reserve is highly mediocre. Which, in a world full of outstanding sub $30 bourbons, is a real shame. I agree. Woodford Reserve has a very thin palate which really doesn’t float my boat. 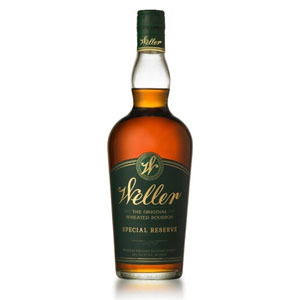 Their master distillers editions can sometimes be quite interesting, however they usually are usually triple the price of the standard bottlings. I probably won’t be replacing the bottles in my bunker. Save your money and get WR101 or Evan Williams SB. Or pay the same for WT Rare Breed or RR SB. All much better choices. I’ve always passed on woodford cause reviews mentioned THIN. But bottle looks GREAT. Wonder if some sort Oxidation will fix the paint thinner notes away ? Maybe even try a lime to cut bitterness. I have a old Dickel 12 with that paint thiner note problem too as well the rotton fruit and acidity. I’ve tried breathe it overnight and tried empting some to other bottles but its not Evolving yet! Had dickel 12 and 8 before and were perfect! Thanks for the thoughts on Woodford. I have heard so many good things about this bourbon, so I went out and bout a 750ml and have now nearly finished it. I must agree with those who find this one a little lacking. Strong alcohol on the nose and palate for a whiskey that is essentially 90 proof (similar experience, I think, to those who noted a “paint thinner” or “chemical” quality). I picked up the fruity and mild oak notes, but unfortunately they were too few and far between. I had a much better experience with the double oaked about a year ago. It might just be this particular batch. I had a dram of Woodford tonight at a local bar. I too found it very mediocre. I found the nose lovely as the cherry and apple really shown through, but on the palate and finish it was largely astringent, oaky, alittle nutty, and not a whole lot of anything else. It did however make a solid Manhattan. Thanks again for all your work on here, Nathan. I get the “paint thinner” too when I take big gulp, if I sip it slowly it it very enjoyable as a daily-drinker, a bit bland, but good. I much prefer the cheaper Buffalo Trace. 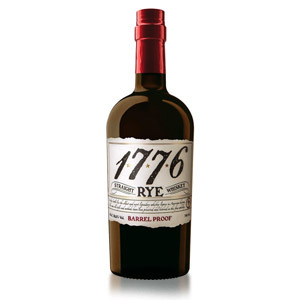 Otherwise, for now, my favourite bourbon is Baker’s 7, it is as good as some of the higher end scotches. Highly recommended. Do not drink this whiskey out of a Glencairn glass. My experience is that tulip shaped glasses hold too much of the offending characteristics common in cheaper higher proof bourbans. Try a wide mouthed whiskey glass with a small bit of chrushed ice, and allow the whiskey to mellow a full five minutes between pouring and drinking. The ice ought to be fully melted and the whiskey only slightly chilled. 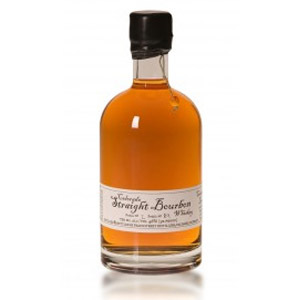 You will have an enjoyable rich bourban that fits nicely into this price range. Its wrong to compare this whiskey with a high dollar scotch. As an American whisky lover I’m ashamed to admit that I just don’t get bourbon. I’ve never had one that I really liked, and with so many great single malt scotch and a couple of great single pot still Irish whiskies in the world, I just don’t have the time or the budget to keep trying bourbons until I find one that I like. I’m with you Joe. I’m the same way. I used to think bourbon was it until a friend talked me into trying a scotch 35 years ago. Bourbon does taste better in a coke, and that’s where it belongs. 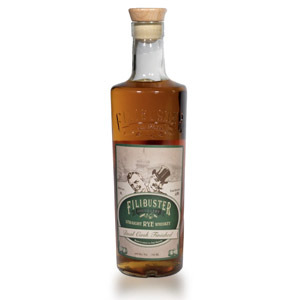 When I first tried it, also from a sample bottle, and fresh from tasting Bulleit, I loved it. Bulleit felt very spice-forward and WR smelled and tasted mellower, more inviting, more “session whiskey”-y. At a second tasting it felt blander, less interesting, and I did catch the slightest chemical whiff (acetone?) — something I associate strongly with its Brown-Forman brother JD. But maybe it was from trying from an already previously opened plastic sample bottle? Ah well. Maybe I should try it again? My family and I throw a Kentucky Derby Party every year and go through ah-LOT of Woodford Reserve during said party. Two years ago, I think we had 12 bottles on hand and there was nary a drop after all the guests left. I used to tend the bar for the party but have since graduated to being in charge of cooking all the meat and WR makes for fine mop sauce. It is quite passable in a mint julip and it is the Official Bourbon of the Kentucky Derby so it’s place in our yearly gathering is quite safe. But drank neat, in my humble opinion, it has some flaws. The artificial, plastic notes are unavoidable and take away from the experience. I simply can’t get over the word “petroleum” when tasting it. I’d pay $15 more for Blanton’s every time. Now all that said, when throwing a Kentucky Derby Party, WR is probably the one you want for your guests. The price is maybe a bit high, but close enough, it makes a decent mint julip, and it adds to the ambiance. The Blanton’s is for you and your close friends who are standing by the grill and smoker, providing you with the invaluable service of telling you that you didn’t screw up the meat for the party.